We do all of our editing in-house. We offer full non-linear digital off-line/online editing and graphics, and we use the latest in digital editing technology. 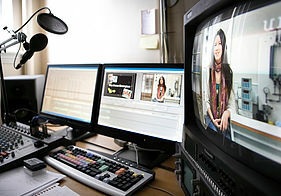 We work on both AVID Media Composer HD and Final Cut Pro X. We can render your video in any format and compress it to use in Social Media outlets such as YouTube, Facebook, and your website.